Orange, the Arausio of the Romans, is still distinguished by some noble monuments of antiquity. 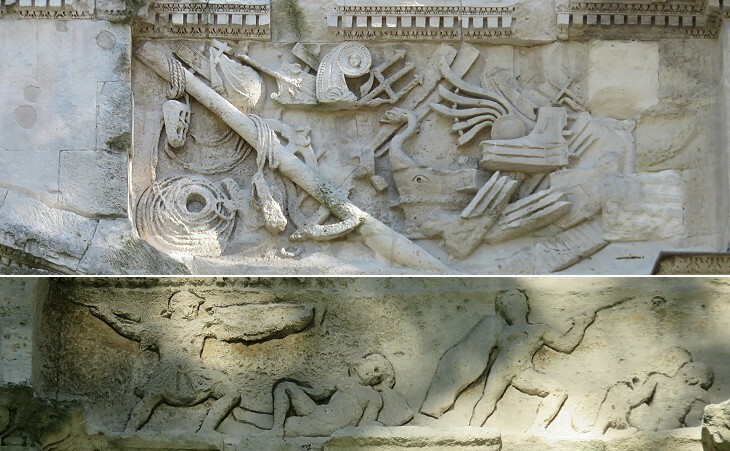 These consist of a circus, an aqueduct, a temple, and a triumphal arch. 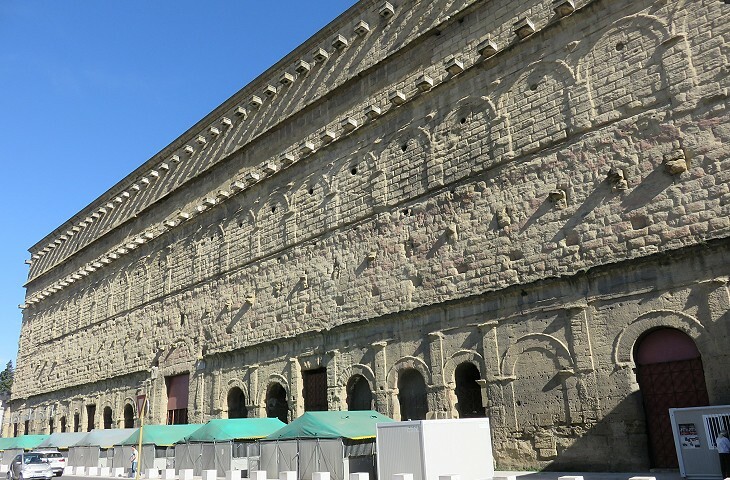 (..) It is a very magnificent edifice, adorned on all sides with trophies and battles in basso relievo. The ornaments of the architecture, and the sculpture, are wonderfully elegant for the time in which it was erected; and the whole is surprisingly well preserved, considering its great antiquity. It seems to me to be as entire and perfect as the arch of Septimius Severus at Rome. In the neighbourhood of Orange (..) an inhabitant of northern climes will here behold the face of the country totally different from what he had been accustomed to see. Corn fields, vineyards and numberless mulberry trees diversify the enchanting prospect: here are also to be seen some olive and pomegranate trees. We are now on truly classic ground and the farther we proceed the more numerous and interesting are those monuments of antiquity which the Romans left in this country. Orange was a post of consequence under the Romans, who called it Colonia Secundanorum, and erected many sumptuous edifices for the use and entertainment of its inhabitants: part of them are still to be seen. The principal monuments are, 1st. 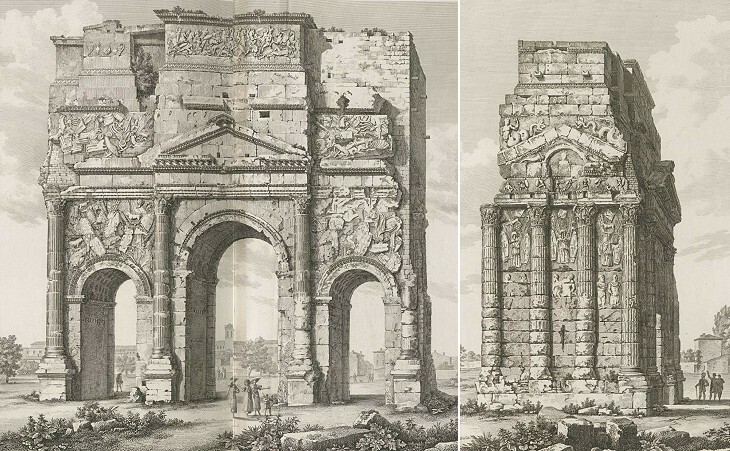 A triumphal arch of the Corinthian order, now menacing ruin, the pillars that have been built to support it being too weak for the purpose. 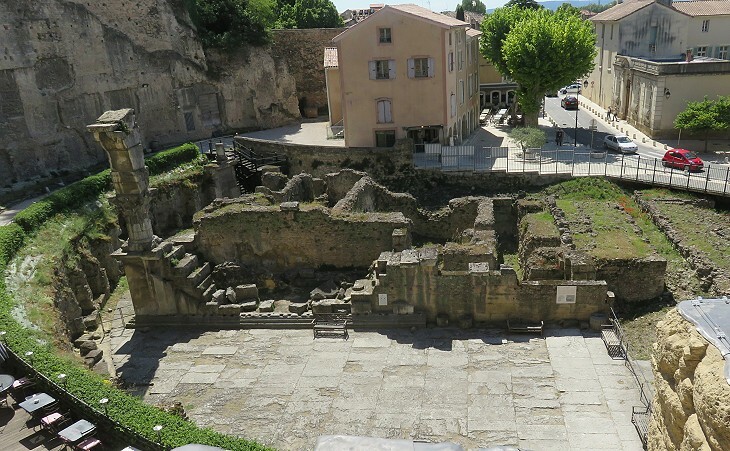 This town situated about 3 m E of the Rhone was the ancient Arausio and is remarkable for the interesting Roman remains which it possesses. The principal ones are 1. 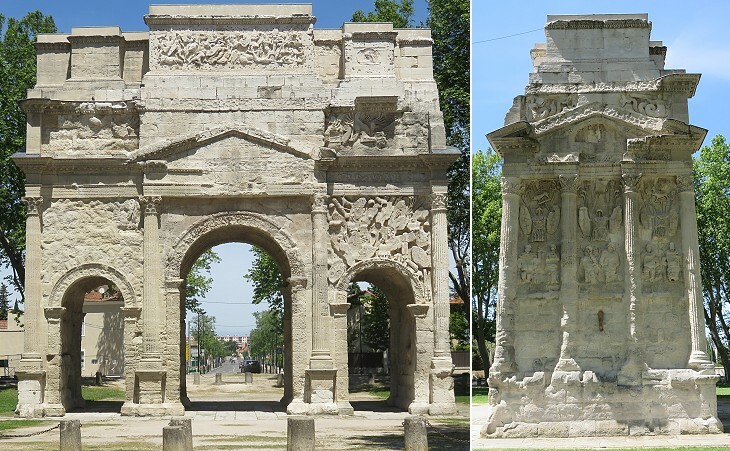 The Triumphal Arch situated about 1 m outside the town on the road to Valence. It is a handsome structure in a good if not in the best style of Roman architecture; its preservation is remarkable considering that it was incorporated in the palace of the Princes of Orange and the deep yellow tints of the stone, a tertiary limestone abounding in fossils of which it is composed, have a rich effect. (..) The building has been very judiciously repaired. 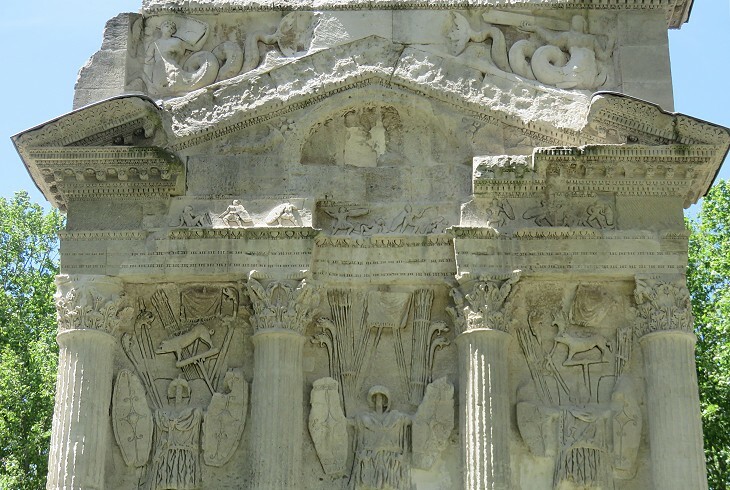 Today there is a general consensus that the purpose of the arch was to celebrate the deeds of Emperor Augustus and in particular his naval victory at Actium and the pacification of Gaul. A series of holes which were caused by the pulling out of nails supporting the bronze letters of an inscription have been studied at length (similar to what was done in Rome). The current opinion is that the inscription was a dedication to Emperor Tiberius in the year 27 AD and that it was added rather than being planned for in the design of the arch. 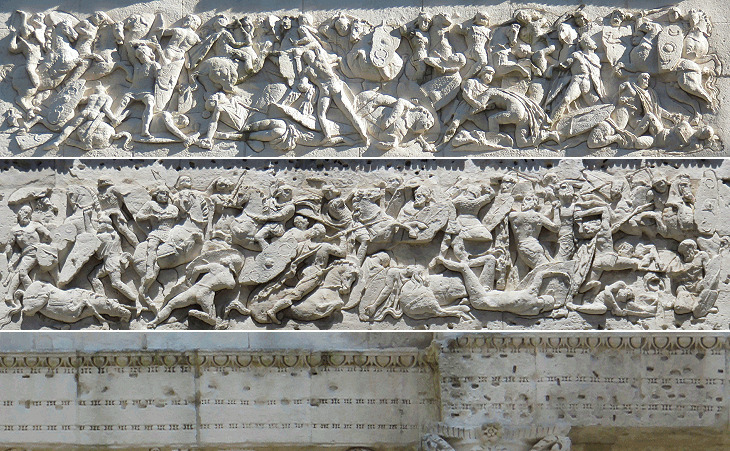 Some archaeologists suggest that the two reliefs at the top of the arch depict victories over the Germans in 13-17 AD by Julius Caesar, the highly popular nephew and presuntive heir of Tiberius who is best known as Germanicus and who died in 19 AD in mysterious circumstances. In 41 AD his brother Claudius was proclaimed emperor. 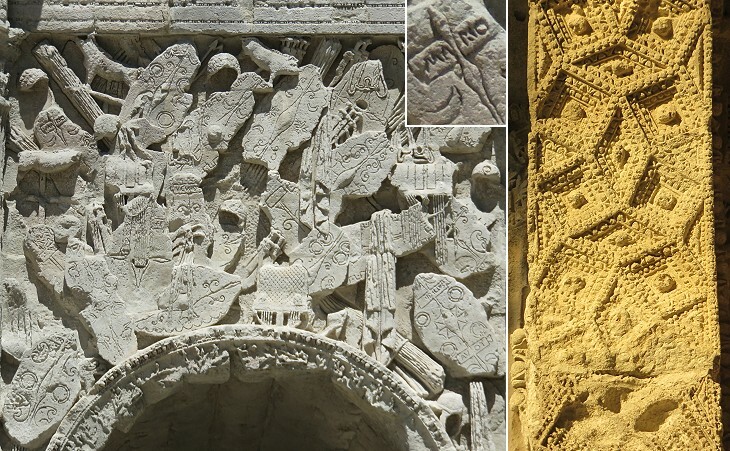 The overall decoration of the arch is indicative of who erected it, i.e. the Roman legionaries who were involved in the conquest of Gaul by Julius Caesar and eventually were rewarded by Augustus with a distribution of land which led to the foundation of Colonia Firma Iulia Secundanorum Arausio on the site of a previous Gallic settlement. Secundanorum is thought to be a reference to Legio II Gallica. The war trophies on the sides of the arch are very similar to those which can be seen on Colonna Traiana. The boar was a standard of the Gauls. The most remarkable monument of this city next to the triumphal arch is that which is improperly called the Circus. Coxe in Galignani's Traveller's Guide. Swinburne made an attempt to explain why the theatre was locally known as the circus and thus referred to by other English travellers. Dating from the Augustean period, the Theatre of Orange is one of the largest Roman theatres known, and, moreover, the best preserved, since the wall of the façade (103 meters long by 37 meters high) and that of the stage still exist in their entirety, although deprived of their marble facing. 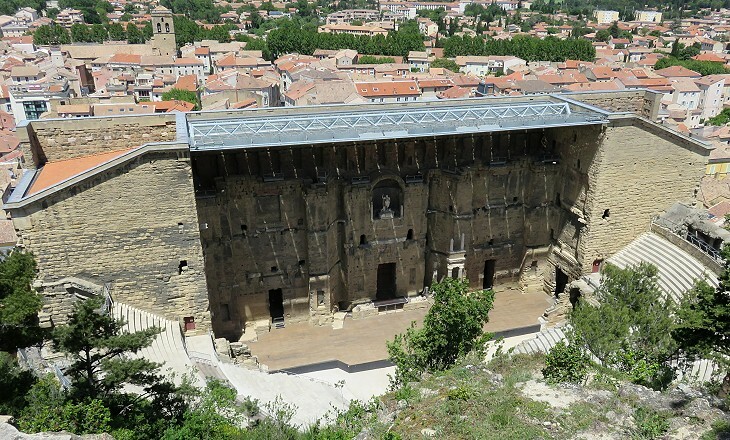 From the description of the criteria utilized by UNESCO to include the Theatre of Orange in the World Heritage List in 1981. 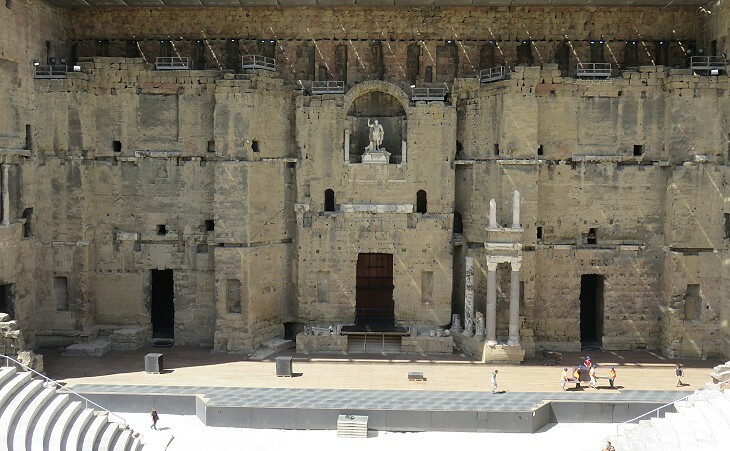 In the early XIXth century the Roman theatre of Orange was thought to be the only one which had retained its scenae frons, the high wall behind the stage which was decorated with columns and niches. 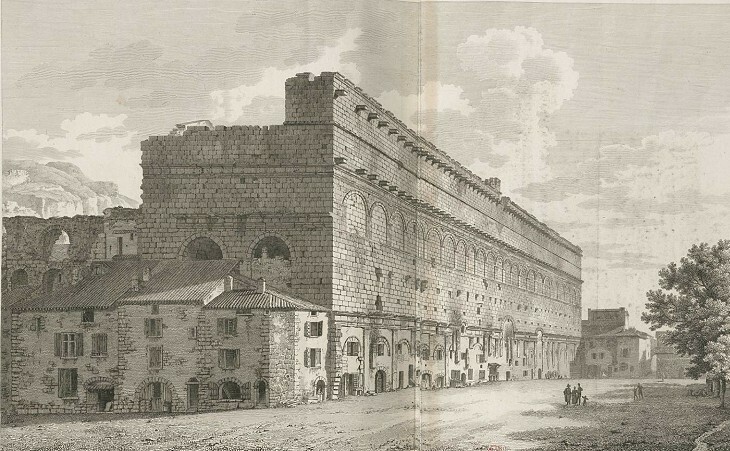 In 1838 Charles Fellows reported that the theatre of Aspendos in Turkey also had its entire scenae frons and later on news came that the Castle of Bosra in Syria was actually the shell of a well preserved Roman theatre. 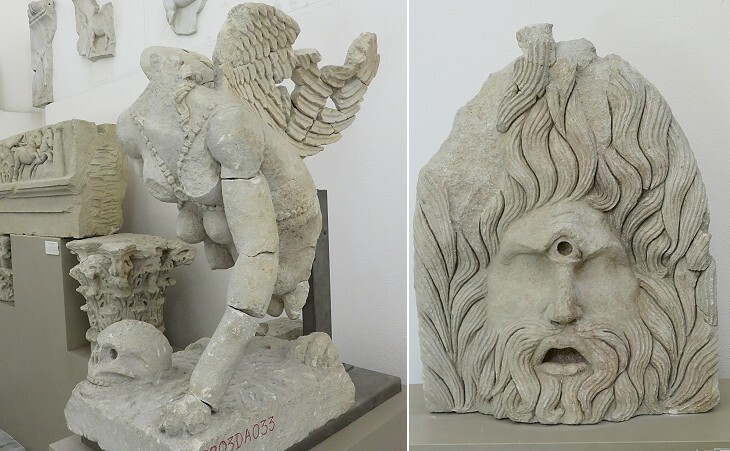 These three specimens and in particular that of Bosra have been used by archaeologists for the reconstruction of the scenae frons of many other theatres, e.g. at Sabratha. In the colonies of my soldiers, as consul for the fifth time, I gave one thousand sesterces to each man from the spoils of war; about one hundred and twenty thousand men in the colonies received this triumphal largesse. (..) To the municipal towns I paid money for the lands which I assigned to soldiers. (..) The sum which I paid for estates in Italy was about six hundred million sesterces, and the amount which I paid for lands in the provinces was about two hundred and sixty million. I was the first and only one to do this of all those who up to my time settled colonies of soldiers in Italy or in the provinces. And later (..) I paid cash gratuities to the soldiers whom I settled in their own towns at the expiration of their service, and for this purpose I expended four hundred million sesterces as an act of grace. The distribution of land to the veterans was preceded by a survey of the ground (centuriatio) in order to identify the size and location of each individual farm and the need for roads and irrigation canals. The records of the survey were used for tax collection and legal proceedings. Each farm had a square shape which resulted in creating an orderly grid of fields which can still be noticed in the current landscape of some areas in Northern Italy. 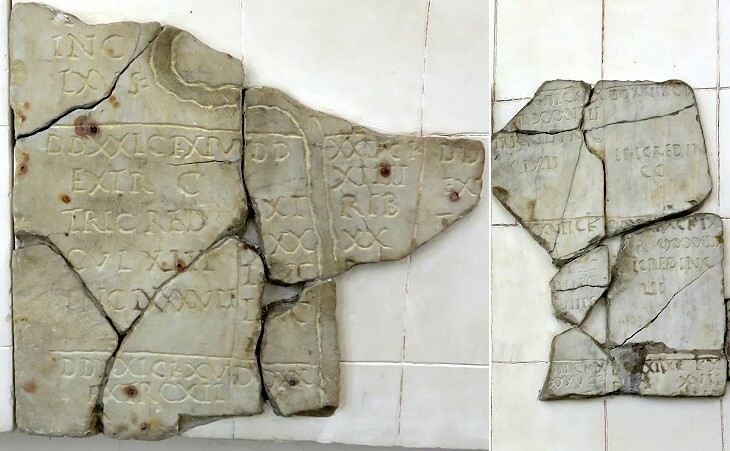 During the rule of Emperor Vespasian the centuriatio of Orange was updated and the results were carved in a marble map containing data on property and tax value. Each farm was identified with reference to a system of Cartesian coordinates with D(ecumani) as x and C(ardi) as y and its area was expressed in jugeri (0.25 hectares / 0.623 acres). The maps indicate that some farms no longer belonged to veterans (TRIC RED = returned to the Tricastins, the original Gallic inhabitants of the region) and some parcels of land were for public use. 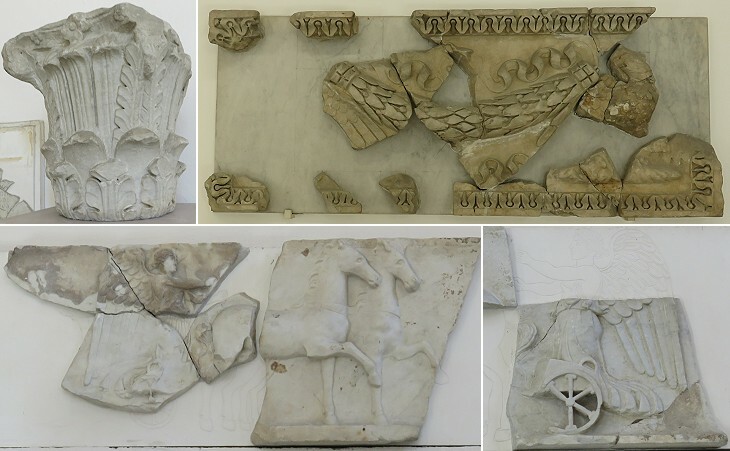 Theatres have often been a mine of archaeological findings because they were usually decorated with statues and reliefs. From this point of view the search for ancient works of art at the theatre of Orange was rather disappointing. The monument had not been covered by earth or rubble as many others and its marbles were most likely calcined or broken into pieces which were used as building material. The ruins at the side of the theatre puzzled archaeologists for a long time. The semicircular area which contains them was thought to belong to a circus. Today the general opinion is that the area was one end of the Forum of the town and the ruins those of a temple. Other Roman monuments most likely stood at the top of the hill into which the theatre was partially excavated. They were incorporated into a fortress which was razed to the ground by King Louis XIV. 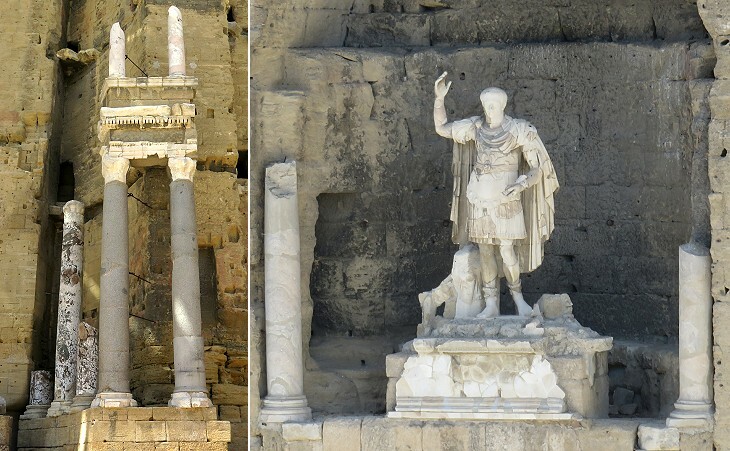 The Roman heritage of Orange is peculiar in the sense that it has two large monuments in a pretty good state of conservation, but almost nothing else. It is likely that the town was no longer a prosperous one during the IInd century AD which elsewhere was characterized by the construction of grand monuments. We know that the individual small farms of the veterans at one point were unable to compete in the marketplace and their owners went bankrupt. 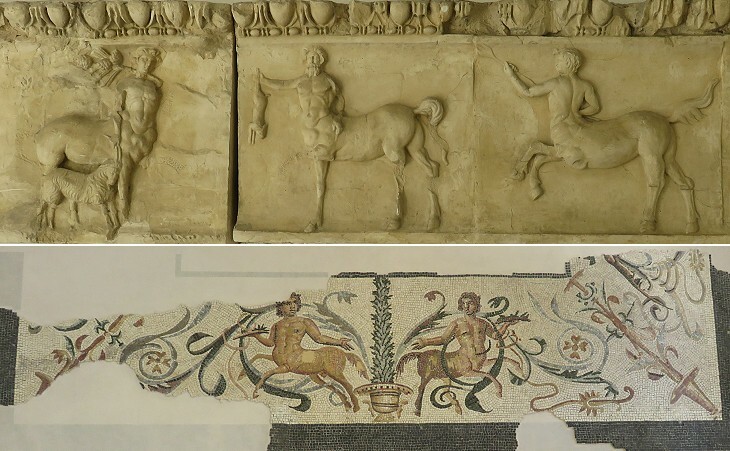 Archaeological museums in many towns of Southern France have plenty of coloured floor mosaics, e.g. at Vienne, but this is not the case at Orange. What said for floor mosaics applies also to sarcophagi and other funerary works of art. A very interesting statue from a tomb which portrays a sphinx is dated approximately the same time as the Arch and the Theatre, thus confirming that Orange had his best period soon after its foundation. The sphinx and the skull would have been praised by XVIIth century Roman artists as a fine example of Memento Mori (Remember that You Will Die) sculpture. The sphinx was one of four which protected a tomb. 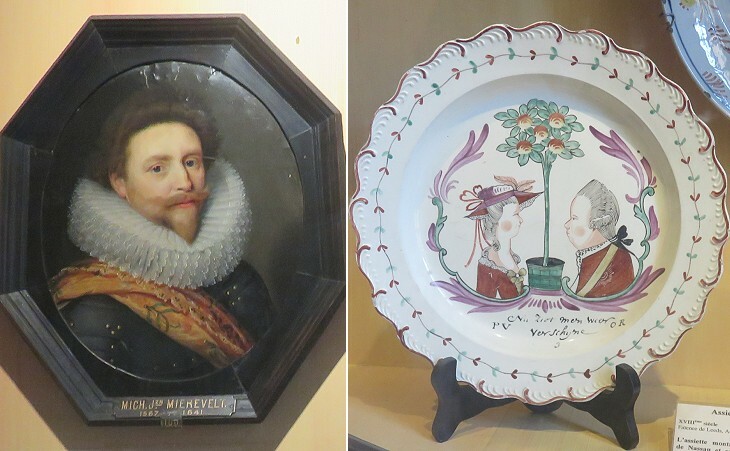 The town, together with the principality, was devolved by marriage to the princes of the house of Nassau, in whose possession it continued for many years. Maurice prince of Orange made it a regular fortress, but the town and principality were seized by Lewis XIV, in 1660, and the fortifications entirely demolished. It was restored to king William bv the treaty of Ryswick, but after his death old Lewis seized it again, and expelled the Protestant inhabitants. By the treaty of Utrecht it was confirmed to the crown of France though the title is still retained by the house of Nassau. (..) The principality is a very small district, being twelve miles in length and nine in breadth; the prince's revenue amounted to about five thousand pounds per annum. The orange colour is still a symbol of the Netherlands. From this spot is a most delightful prospect of great extent and full of the most interesting objects. You behold the territory of Orange whose productions are so various, the plains of the ancient Comtat Venaissin; now the department of Vaucluse; a part of Provence and Languedoc with the mountains of Dauphiny and the noble stream of the Rhone. 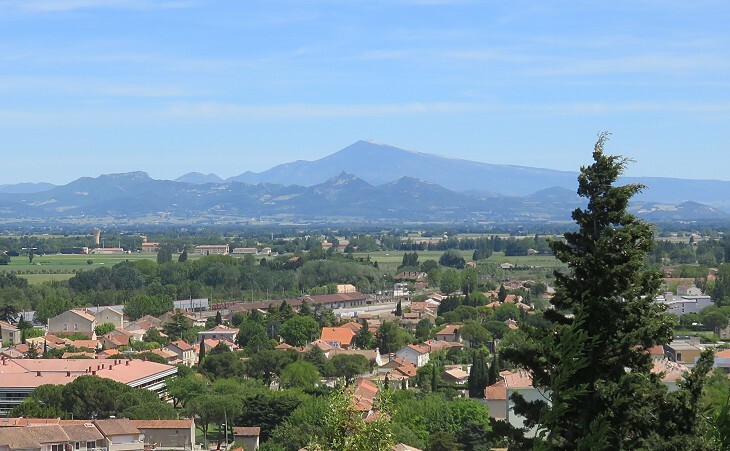 To the south the innumerable spires of the steeples of Avignon seem lost in the perspective while all around are the richest points of view; (..) Mont Ventoux and its hoary summit generally covered with snow and the handsome embattled walls of numerous towns. Amidst this delightful scenery the intelligent traveller looks with satisfaction on this classic ground where the Romans took delight in leaving so many monuments of their grandeur and power. The climate is heavenly, the soul is exalted, the eye is ravished, the imagination enchanted; you forget the world, you think you could remain here for ever! Coxe in Galignani's Traveller's Guide. Ventoux means windy and this isolated mountain (1,909 m - 6,263 ft) is a landmark of the final section of the River Rhône valley.